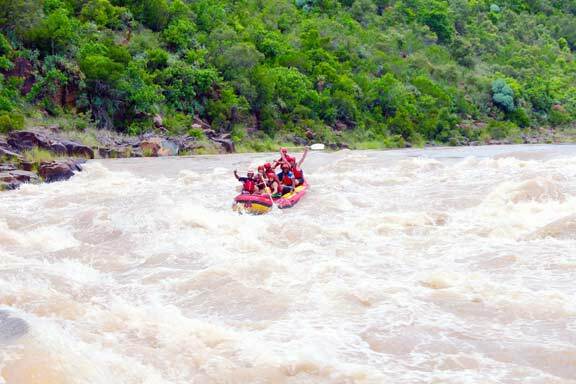 Kayaking or rafting on three different one-day stretches of the Tugela River, KwaZulu-Natal. This is our flag ship route! Your typical one-day outing and you’re looking at five to six hours on the water. It is surprisingly big, fast, continuous and friendly (rapids from class 1 to 3+). You will be seeing parts of the Tugela few people do, and it is our intention to keep it that way. You will not be paddling on crowded river! Our second regular one-day paddle. A bit shorter but equally as good. Action packed from start to finish. 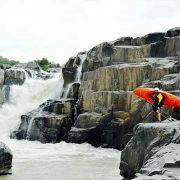 When the Tugela really gets going there is some enormous white water to be encountered. Rapids ranging from class 1-5, no sweat. And when you’re done you will be pulling in at the Pig and Plough farm shop for a burger, pizza or a pie! This is the big one! We’re heading down the first 15km of the Tugela Canyon, which is legendary. It is wild, scenic, rugged and isolated. Rapids like Rocky Horror and Klip Rapid are some the stand outs. Throw in a few waterfalls amongst it too. Action literally right from the start! When to go: Best during high summer (December to March). Itinerary rating: Moderate to hard. Children younger than eight years of age will not be permitted to take part in white water activities. Other information: Experience is not a strict requirement. 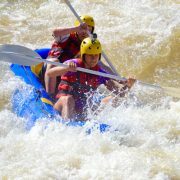 However, being familiar with rafting and having some experience is beneficial and recommended. There is no definitive elderly cut off age, as long as the person is physically able and generally fit he/she will be permitted to take part. Group size is limited to twelve persons. Regardless of group size the party will be accompanied by two trained and qualified river guides. Points of interest: Spioenkop Nature Reserve, Skietdrift Historic Site, Cromley Bank River Camp, Colenso Falls, Little Augrabies, Harts Hill Falls.